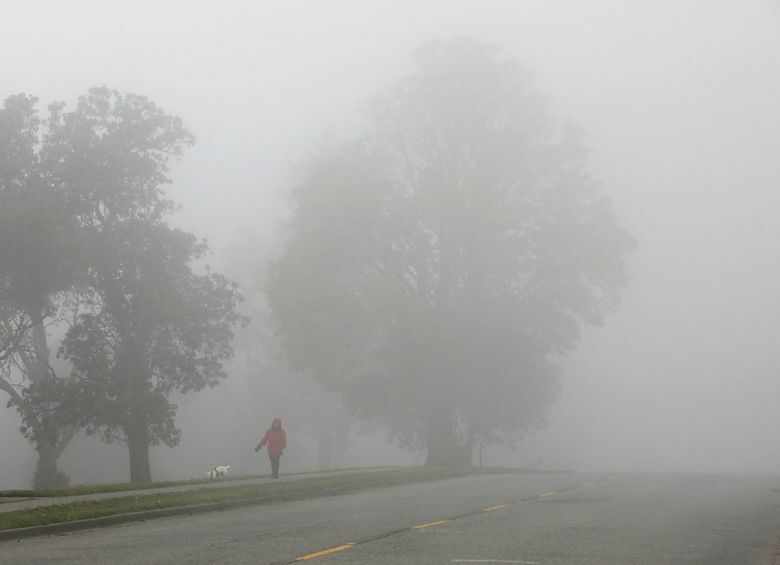 Dense fog in some parts of the Puget Sound area, particularly from SeaTac south to Olympia, could affect the morning commute, according to an advisory from the National Weather Service in Seattle. Visibility has been down to one-quarter of a mile in some areas, while other areas are clear, said meteorologist Carly Kovacik. “It’s been kind of hit or miss,” she said. The advisory is in effect through 9 a.m.
Once the fog clears out, it’s possible that clouds will move in, the weather service is forecasting. Tuesday will be the last fully dry day for the region, Kovacik said. The chance of showers will begin to increase on Wednesday, though rain is likely to primarily hit along the coast and Olympic Peninsula, she said. More widespread showers are expected Thursday, and by Friday, it’s likely to be rainy and breezy, the weather service says. Kovacik said Wednesday’s high should be in the upper 40s, and Thursday could reach into the lower 50s. Goodbye, goodbye to those clear skies. “It sure was a nice weekend,” Kovacik said.